Trash – the final state of matter?! Petruccelli proposes to explore trash as the material expression of death and rebirth. Trash, especially plastic, has immense creative potential that the artist will use to induce new perceptions. The artistic education of Francesco Petruccelli is based upon different studies and experiences. Beginning with the studies of Art and Humanities at the Università degli Studi in Milan, continuing with the work of cameraman in places like Haiti and Congo and finally concluding his formal education with Fine Arts at the Universität der Künste in Berlin, he was able to develop a complex artistic language whose main characteristics are a certain intellectual - almost philosophical - density, attention to the paradoxes of existence, and a visual description of psychological processes which is always precise and brutal at the same time. © Diana Pacelli Even in his first exhibitions (e.g. 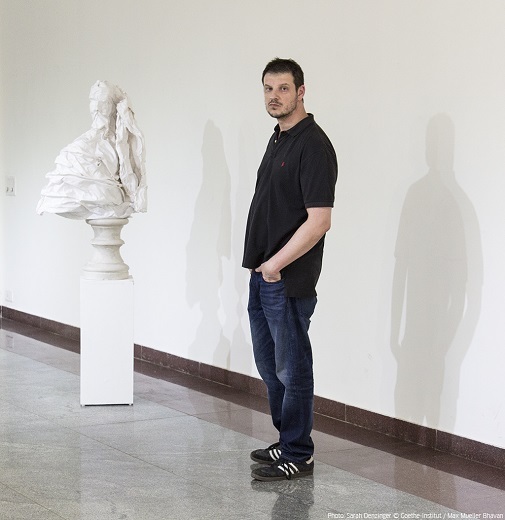 at Neurotitan in Berlin in 2014) he focuses his interest on the contradictions of identity: in his sculptures the head in particular is the battlefield of instincts and tensions which cannot find a solution. By combining the use of the archaic technique of the encaustic with the perception of the pedestal as psychological support of the sculpture, he depicts the problematic unity of the ego and its inconsistency. His analysis of the mental processes deepens and broadens its horizons in works in which he dialogues with the theories of K.G. 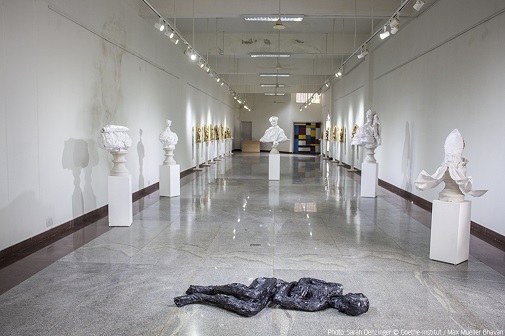 Jung: in Berlin for Schauwerk in 2015 and at erstererster gallery in 2016, the artist presented sculptures and paintings whose main theme was the absence – the metaphysical void which remains, once every judgement that we pass about things turns out to be partial and false. From this perspective, his use of trash as material for his statues has an ontological meaning: trash is what has lost any cultural significance, it represents the absence of human values… and yet, it remains with its unknown life. 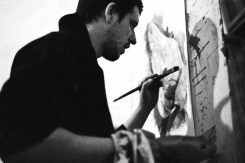 The abandoning of a subjective perspective becomes definitive in the works he presented between 2016 and 2017 at Cruise & Callas and Schillerpalais, among others: his paintings of paintings and radiographies not only deny the human perception of art, but also reveal the hidden, subconscious identity of an artwork. On the other hand, in other paintings done with the collage technique the artist destroys every possible personal meaning, in order to give to the viewers an empty visual space to fill with their own content and association of ideas. During the bangaloREsidency Francesco Petruccelli will work with Daily Dump to explore trash, its ambiguous condition of ultimate, entropic state of matter and key for a new cultural evolution at the same time. As material expression of death and rebirth, trash has immense creative potential that the artist will use to induce new perceptions of it. The experience of the bangaloREsidency has been very positive from many points of view. The Goethe-Institut organised my residency very efficienly. More specifically Claus Heimes, Maureen Gonsalves and Anna Hofer were the persons of the Goethe-Insitut I dealt the most with: they have been supporting me in every decision I took regarding my project in India. Their advices were always meaningful and professional and, whenever I needed help for practical matters, they were always promptly available. On top of their professionality, their high level of culture and sympathy helped a lot the communication between us. Also, I had a very positive experience with he organization which hosted me: Daily Dump. In particular Poonam Bir Kasturi, CEO and founder of the company, supported me in so many ways: doing sculptures can be difficult if the if one doesn‘t have the proper space and adequate tools for it, but poonam offered me a very good space were to work – the storage room of her company – and anytime I needed some tools or materials for my work, there was always somebody of Daily Dump which was ready to help. Working in the office of Daily Dump has been very funny and also important for me to know better India, but I especially appreciated the conversations I had with Poonam about the environment of Bangalore and the visits we did to the difficult areas of the city: I could see in a very direct way the core of certain problematics of this city and understand the social and economical mechanisms that drive them. All of this has been incredily useful to develop my project. I strongly recommend the bangaloREsidency, in particular with Daily Dump as host: Bangalore is a city with very complex dynamics, which are mostly very different from the ones of the city I live in, but the Goethe-Institut and Daily Dump gave me the chance to understand a lot of it, and therefore to make artworks which reflect its complexity.